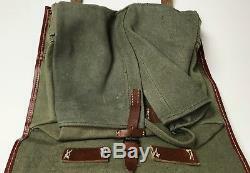 WWI GERMAN M1915 TORNISTER FIELD BACK PACK. 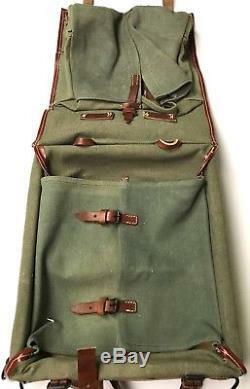 The WWI German Tornister pack M1915 was the same as the M1907/13 pack minus the fur. Packs were Issued to every infantryman for carrying personal kit and rations after 1915. Constructed with a rigid interior wood frame which is covered with grey/green canvas on both sides. Features thick supple leather straps with white stitching. 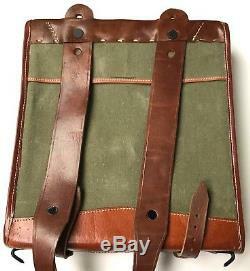 Comes complete with adjustable leather shoulder straps. Measures approximently 13" X 5" X 14. BRAND NEW MUSEUM GRADE REPRODUCTION. 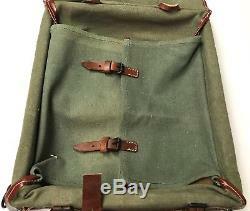 The item "WWI GERMAN M1915 TORNISTER FIELD BACK PACK" is in sale since Thursday, August 03, 2017. 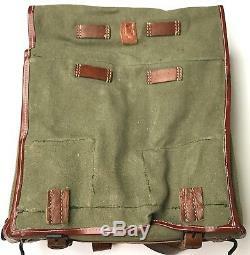 This item is in the category "Collectibles\Militaria\WW I (1914-18)\Reproductions\Germany". The seller is "luckyline1945" and is located in Pierre, South Dakota. This item can be shipped worldwide.